Front Porches to Front Lines uses the story of your great grandparents to tell a larger story about a small town affected by WWI. What was the inspiration that made you want to put this story into a book? There were actually several inspirations which motivated me to turn my great-grandparents’ story into a book. Perhaps the most basic of these is simply the fact that I love history and thoroughly enjoy doing the research and writing about it. With that being said, the best way to cover all of the inspirations behind this book can probably best be told by talking about how the book began in the first place. 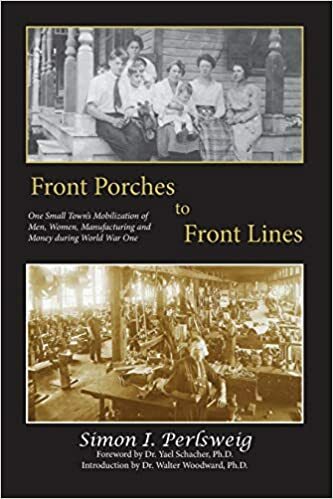 Front Porches to Front Lines is actually the expansion of a college essay with a similar title. I had always heard from my mother that there was letter somewhere in a box which talked about what took place on Armistice Day in 1918 in the small town of Springfield, Vermont where my great-grandparents were living at the time and I’d always hoped that I would find it someday. When I re-enrolled at the University of Connecticut in 2014 to finish my B.A. in American Studies I made up my mind that I wanted the remainder of my coursework to include an independent study project which would be completed under the guidance of a faculty advisor. Fortunately I found this letter and soon after found an advisor in Dr. Walter Woodward, a professor at UConn and the State Historian of Connecticut. During the Fall 2014 semester, I researched World War One and the subsequent Influenza Epidemic of 1918 and in turned used the letter about Armistice Day and about 300 more family letters to tell the story of my great-grandparents’ experiences at this time as a microcosm of how the war and epidemic impacted people on the local, regional, national and international levels. While, one of my biggest inspirations to write this book was to record my family’s story, I chose to tell this story in particular because of the wealth of primary resource material available to me and also to help expand the knowledge and scholarship of a chapter in the history of the United States which in some ways has gone largely overlooked until recently. Lastly, I chose to turn this story into a book because it simply kept me busy with something I enjoyed doing. Since finishing my degree in the spring of 2016, my job hunt has been largely unsuccessful and expanding the essay which was my “senior thesis” of sorts into a book had given me a project to focus on amidst my bad job prospects. Plus, I was also of the belief that it would make my resume stand out in the future in a way that not many recent undergraduates’ resumes do. However, these last reasons are all somewhat secondary to those mentioned above. I enjoyed the historical information provided in the book. What kind of research did you undertake for this book? The scope of my research for this book was very broad and in fact I learned a lot of doing research and research methods on the fly while compiling the materials for Front Porches to Front Lines. The bulk of my research, about 60% of it, involved the careful analysis of the letters between my great-grandparents as well as those written between other family members and a few of their friends as well. I feel very fortunate to have had such an archive at my disposal while writing my book because it’s those letters which make up the majority of the family story which is at the center of the book. Aside from the analysis of the letters, I conducted a handful of interviews, one with my great aunt, who is my only living relative at this time who knew all of the family members referenced in the book; I also interviewed the couple who run the historical society in Springfield, Vermont on two occasions to get a sense of what materials the town had left from the World War One era; and lastly, I interviewed a number people who had lived in Springfield during the first half of the 20th century and had some recollections of stories their parents and relatives had told them about Springfield during the 1910s. I spent many hours in the public library in Springfield going through the microfilm they had copies of their local newspaper going back to World War One and was an excellent source of soldier letters as well as advertisements relating to both the war effort as well as the many remedies people were trying to cure themselves of the Spanish Flu. I spent time combing the objects and other materials at the Springfield Art and Historical Society and lastly, I used any primary source material related to war that I could get hands on along with a handful of pictures and other items from my family’s records. What were some things that you found surprising about your grandparents lives? To be honest, the majority of the information about my great-grandparents’ lives which I included in the book was all new to me. Since the location of their letters had been somewhat unknown for such a long period of time and since my family didn’t talk about many of the aspects of their lives that were detailed in these letters, much of what I learned from them was both new and surprising. For instance many of the down to earth details about daily living during this tough chapter in our nation’s history left me both surprised and amazed, especially given the circumstances of the world in which I grew up in the 1990s and 2000s. I was repeatedly left in awe of my great-grandparents’ ability to press on from one day to the next, when under the constant threat of a potential German invasion, the rapid spread of an infectious disease or both. One particular episode during the 1910s which I found particularly curious actually was referenced in a letter between my great-grandmother and her sister. In this letter, my great-grandmother’s sister talks about hearing former president Theodore Roosevelt speak at a rally to raise awareness of the Armenian Genocide. Given, my family’s rather apolitical stances on things, it was surprising to find out that any of them participated in any event that was about an issue which didn’t directly threaten their lives or the nation’s security. I have just begun the research for my next book, which at the moment is going to be a more comprehensive look at Armistice Day and how that day was celebrated around the world. However, since I am also in the process of getting ready to go back to graduate school, I do not have a good idea as of yet as to when that book will be completed and made available. I know that some of it will depend on my graduate school commitments as well as my ability to amass the resources I need to complete this project and do the topic justice. World War One and the 1918 Influenza Epidemic. Two events which will alwaysdefine the 1910s, a decade which saw great political and social change; a long list ofdisasters and a realignment of the global stage, something which would help define manyof the subsequent events of the twentieth century. When the United States declared war onGermany on April 2, 1917, it was just the first of two major calamities which would in someway impact just about every American man, woman and child during the latter half of the1910s.The second of these wars, the Spanish Influenza of 1918, came right on the heels of theGreat War’s conclusion on November 11, 1918 as many of the returning soldiers camehome with the influenza virus, having caught it either in Europe or sometime during thejourney home from France. Front Porches to Front Lines tells the story of how the citizensof one small New England town, came together to confront these two wars and in doing sobecame one of the most generous towns when it came to contributing to the war effort inthe form of Liberty Loans, war gardens and war supplies as well as dozens of soldiers, RedCross nurses and civilian workers, such as machinists.